There are many free disk drive space management and scanning tools out there in the Internet available to use. 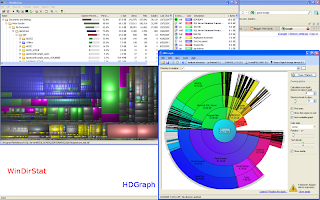 I have used HDGraph (www.hdgraph.com) for a while to show disk space; I liked the circular graph it displays. I have some vague memories of some showing me a tool, and I think it was Space Monger, but it never did appeal to me as compared to HDGraph. This morning, I decided to look for other alternatives and compare HDGraph. I downloaded WinDirStat and found that it had advantages right away. Please note, you'll need to look beyond the unattractive yet informative WinDirStat website, and consider the tool on the value it delivers. Also, please note, this is but my simple review of the two products, and I am very appreciate of all of the people involved with building and making available these great tools! 1. WinDirStat shows all the directories being processed/read and allows you to navigate the file system and see the sizes while it is processing other directories. 2. The TreeMap in WinDirStat allows you to see large files versus small files that there are many of very quickly. If you are looking to manage your disk space, and have difficulty keeping enough space free, I would recommend WinDirStat or the many alternatives for other platforms.